Scale Size 9.1"x 10.4" x 6"
Class III NTEP Approved Legal For TradeThe National Conference on Weights and Measures certifies the WBW-30aMKG Legal for Trade with Certificate of Conformance Number 10-082A1. So, you can count on getting accurate readings time after time. Perfect for portioning and packaging, as well as, weighing washed produce, meat and more. IP 65 Water Resistant HousingThe WBW 30aMKG has a water resistant housing with an IP (Ingress Protection) rating of 65. This means the WBW30aM KG is protected from dust and low pressure water jets from all directions, as well as, corrosion, sleet, rain and more. So, if ya want to spray off this NTEP approved scale when it gets dirty, go right ahead. Checkweighing FeatureMake sure ya get your weights just right with the check weighing feature. When ya weigh in this mode, you can set weight limits for the stuff you're weighing. So, if your sample weight is too low or too high...the WBW 30aM KG will sure let ya know. Liquid Level IndicatorThis very handy feature will help ya quickly and easily get your scale nice and level. A level scale is important for getting the most accurate weight readings. All ya have to do is twist the feet on the bottom of the scale until the spirit bubble is centered within the level. Rechargeable Battery PackYou won't have to worry about searching high and low for a wall outlet to plug this NTEP approved washdown scale into. The WBW 30aM KG has an internal rechargeable battery with up to 50 hours of battery life on a single charge! 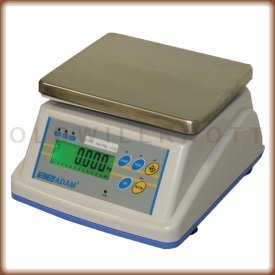 Removable Stainless Steel PlatformThe WBW 30aMKG Legal for Trade scale has a durable stainless steel weighing platform to make cleanup a breeze. Stainless steel doesn't scratch easily and keeps its shine without rusting or tarnishing. Easy To Clean, Sealed KeypadYou won't have to worry about dust and dirt getting stuck under and around the buttons on this food prep scale...The WBW 30aM KG has an easy to clean membrane keypad with accurately labeled keys for easy weighing. Capacity TrackerTo help make sure ya don't accidentally overload your scale while your mixing up batches or recipes, this washdown scale has a capacity tracker right on the display. This will let ya know when you're getting close to capacity, so ya don't go over. 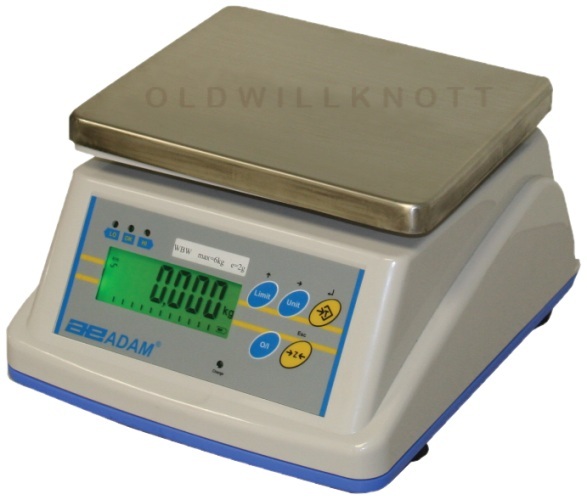 Programmable Backlit DisplayThe Adam WBW 30aM KG has a backlit weight display ya can program to always stay on, turn on with the press of a button, or to stay off. This feature is great for saving battery power. Energy Saving Programmable Auto-OffTo save power, Adam designed the WBW 30aM KG with a programmable auto off feature. Set the auto off timer on the WBW to turn off with 1, 5 or 10 minutes of no activity, or to stay on until ya turn it off yourself.